Hi there! I know it's been a while since we met here in this space. What have you been up to? So many people are sewing away and I see so many great projects on Instagram and on Facebook. Thanks for sharing your great PamKittyFabric projects, it really is so exciting to see so many of you diving into your stashes and cutting it up to make some lovely things. I haven't sewn much lately. Not really sure why. Well probably because I can't decide what to do. I have a lot of tops sitting around, so I pulled those out so I can determine what I have for backings. As usual well laid plans went awry and some backing fabrics became separated from the tops. No surprise, I pile stuff up then dig back through it. It's my own fault. I did find my stripes for binding on the Two by Two quilt and have it sewn on. Hand stitching next. Yesterday I was determined to sit down at the machine and get to work on the last block of my Legendary quilt. Here's as far as I got. I couldn't help but head outside to putter around emptying pots and getting ready for some patio planting. Even though we've had record rains I'm not sure I'm ready to get into any big garden project quite yet. But I'm sure enjoying all the green everywhere. The hills around town are so green and lush, so different than they have been in past winters. Happy weekend, Pam. It's so easy to get distracted by plants and pots and other garden things at this time of year I find! Have fun! I love seeing whatever you have time for. I go in spurts myself. Do you by chance have a new Pam Kitty fabric line in the works? I think about the old blogging days a lot. I did enjoy seeing people's lunches and magazines nd what they were making. You and Elizabth were always having fun meeting "famous" people and going places, and you always saw funny things to share. I hope you are well too Pam Kitty. I've slowed down on the sewing too, and getting ready for gardening and spring cleaning. There is a time for everything. The legendary quilt is going to be fabulous in pink! Missed you here Pam but I always check IG feed too. 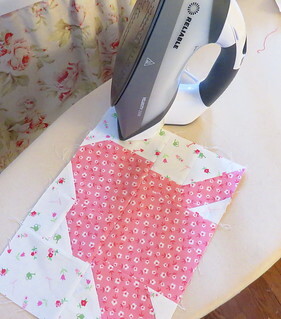 I am doing Th e hand sewing ion a quick baby quilt that needs to be in Chicago by 3/18 for a shower. And then I think I am starting a a Christmas gift....I know! But it's a older kit with lots of hsts so I will have to bring my patience as well as up my game! Hope you have a great weekend. Loved your post - I can totally empathize with you!! Sometimes it is so hard to stay focused or what direction to take next. But I love what you are working on - and hey enjoy your puttering in between :)! !